Over time, the small, 1920’s commercial vernacular brick building at 453 Pacific Street housed a drug store, a delicatessen, and a Laundromat. 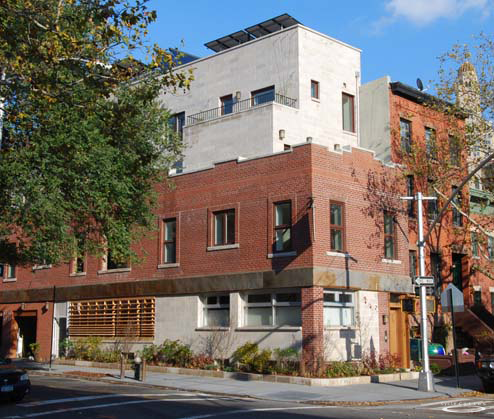 Working with neighborhood developers R&E Brooklyn, Cycle transformed this modest commercial building into two environmentally high-performing residences. A simple new limestone building emerges from the restored masonry structure, and is crowned with planted walls and solar roof canopies. A well insulated building envelope, high performance windows, and radiant floors result in highly efficient heating and cooling systems. Interior finishes and fixtures are recycled, re-used, and non-polluting. The building was featured as Natural Home Magazine’s 2009 show house.